I love making homemade, or handmade, pasta. First off… it’s one of those satisfying, calming, things for me. Making pasta with my own hands is like popping bubble wrap…. In a weird way. Secondly, making pappardelle (the wider fettuccini ) is so easy and doesn’t require any special shapes, or folds, or stuffing anything into it. Now what you do with your handmade pappardelle is also a fun kitchen aspect. Generally flat wide ribbon pasta like fettuccini, tagliatelle, or pappardelle, you would use rich meaty sauces. So you wouldn’t want plain-Jane marinara sauce slopping around on pappardelle because the sauce just slides off. Use a topping that will cling to the noodle and provide a mouthful of deliciousness along with the handmade pasta that you just knocked out. So with this recipe, I chose a few of my favorite flavors to accompany the pappardelle: Pancetta, Leek, and Tomato. Now if you’re from my hometown of Sapulpa and have no idea what pancetta and leek are, in simplest terms, bacon, and onion. Hopefully, you are well aware of tomatoes. The salty unsmoked Italian pancetta, along with delicately onion flavored leeks and rich roasted flavor that comes from the blisters tomatoes are a trifecta made in heaven. Place the flour, semolina, and Cook’s Line Seasoning (or salt) in a food processor. Give it a few pulses to combine the dry ingredients. In a small bowl combine the whole eggs and egg yolks along with the olive oil. Beat with a fork until combined. With the food processor running pour the egg mixture in and process until the flour mixture is damp and crumbly. Turn the dough out onto a lightly floured work surface and begin to knead until satiny smooth… around 3 minutes. Wrap the dough inelastic and leave out on the counter for 30 minutes. When ready to roll the pasta out you may use your pasta rolling machine or do it on the counter top…. Like I do. I’m not opposed to the pasta machine, but when making pappardelle I like to roll and cut on my countertop. 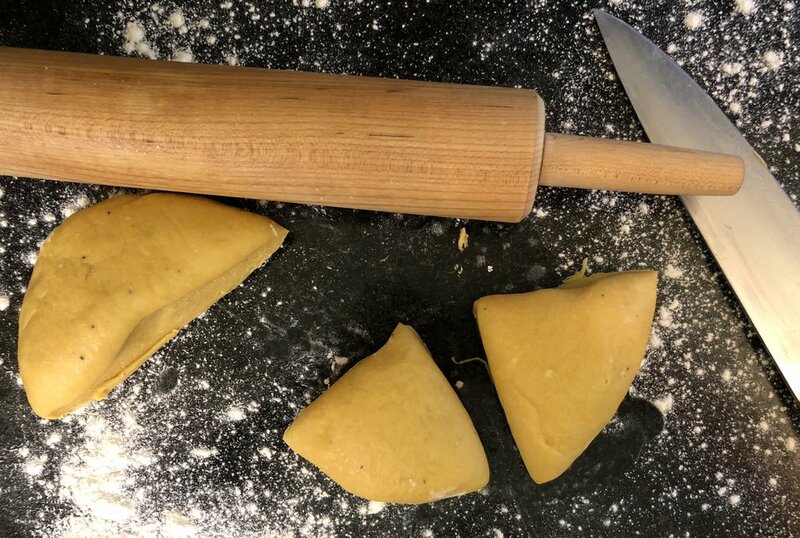 Brake the dough down into three pieces working with one piece at a time. Wrapping the other two pieces back up in plastic, remove one of the pieces to your work surface. Roll the piece out into a paper-thin rectangle. It must be a thin sheet of pasta before cutting… pasta expands when cooking and we aren't looking for noodle but thin wide pappardelle. If you are using your pasta machine, start with the widest setting and STOP before you get to the thinnest setting. Dust with flour between settings. If you’re rolling out on a work surface like I do, I roll out to “penny thin” or “dime thin”, again making sure the pasta isn’t sticking and you’re constantly lightly dusting your work surface. Cut the pasta into 4-5 strips, 10”-12” long. Dust the strips with flour and roll loosely into a pasta nest. Repeat the process with the two remain pieces of dough. It’s okay to make the pasta ahead of time and leave out uncovered s long as they are adequately dusted with flour to prevent sticking. Leeks and Pancetta... or Creek County "Onion and Bacon". So many great flavors for your homemade pasta! Bring a large pot of salted water to a boil for the pappardelle. Add the pappardelle, lightly stirring to break up any clinging. Allow to the pasta to cook to al dente, or “not quite done” to some pasta eaters. While the pasta is cooking, heat one tablespoon of the olive oil in a cast iron pan or heavy bottom skillet. Add the cherry tomatoes and let them sit for 2-3 minutes until they start to blister and burst. Lightly season with a pinch or two of the Cook’s Line Seasoning. Give then a quick stir and let me sit again for 2 minutes. Remove the pan from the heat. In an additional large straight sided pan heat the remaining olive oil. Add the diced pancetta and cook until crispy, about 4-5 minutes. Add the one tablespoon of butter to the pan and let it melt. Add the sliced leeks, fresh thyme, and garlic, stirring and gently cooking until the leeks are transparent and everything is fragrant. Add the blistered tomatoes and toss into the mixture. It’s okay if some of the tomatoes burst and deflate… this is only adding to the “sauce” aspect of the dish. Heat the mixture gently. 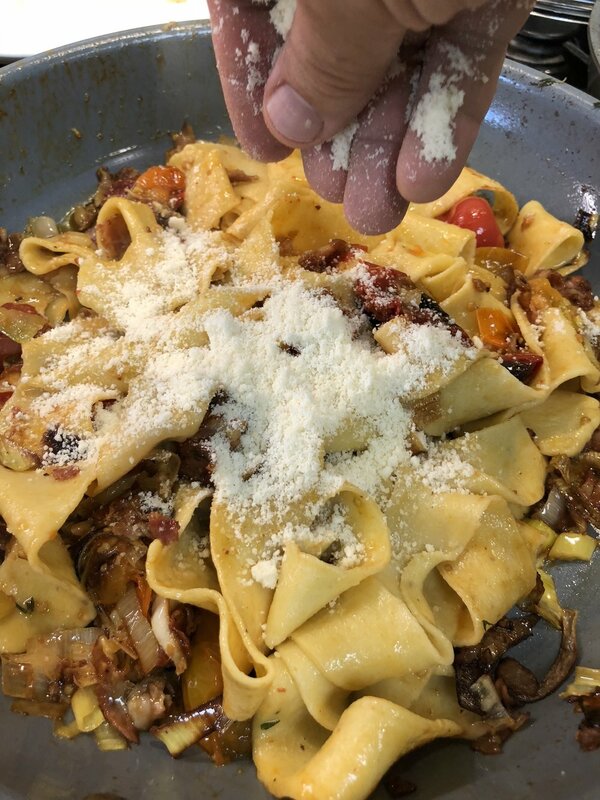 Once the pasta has cooked, drain briefly (reserve a little of the pasta water) and add the pappardelle to the pan. Gently toss the mixture with tongs making sure to coat all of it with the pan ingredients. Add a bit of the pasta cooking water to the pan if it is looking too dry. Toss it all once more with the grated Parmesan or Grana Padano cheese. Pile onto one large platter for family style service or portion out on individual plates. Dig in and enjoy! Add cheese and get after it!